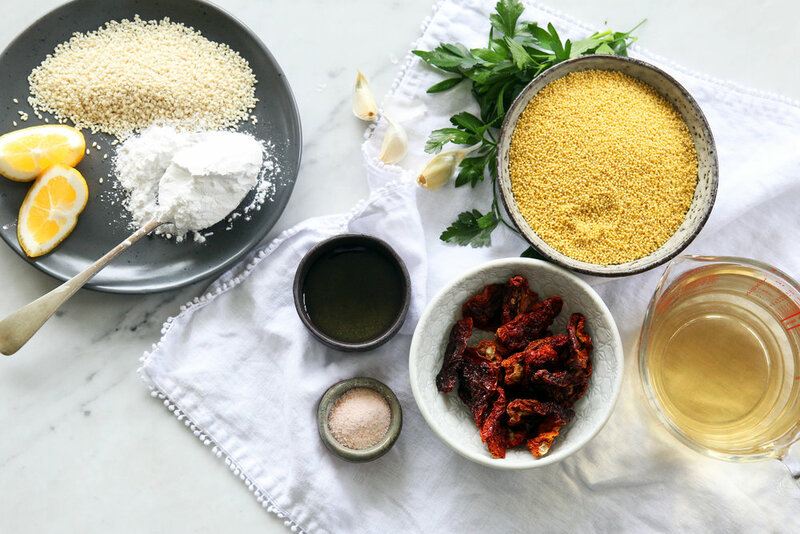 Millet is such a wonderfully versatile grain. It’s gluten free and has a mild flavour. I love to cook it in stock as it absorbs flavour really well. Here I’ve made a spin on Italian arancini. These are delicious as a snack, as part of a shared meal or alongside a crisp green salad for dinner. This recipe is part of some creating I’ve been doing for Good For Store. If you’re not yet familiar with these stylish purveyors of plastic-free pantry items, check out their website or pop into one of their beautiful stores. They are lovely folks and their passion for sustainability is really infectious. Cover the sundried tomatoes in boiling water. Leave for 30 mins before draining well. Pat dry and chop into small chunks. Place the millet, stock, garlic and bay leaf in a medium saucepan. Bring to the boil before reducing to a simmer. Cook with a lid slightly ajar for 20 minutes until the liquid is absorbed. The millet will be a little gluggy as it has absorbed a lot of extra liquid. Remove the bay leaf. Stir through the cheese, olives and sundried tomatoes. Taste and season well. Leave to cool for 15 minutes before rolling into ping-pong sized balls. Place in the fridge to cool for at least 30 minutes. Combine the sesame seeds, almond meal and tapioca flour in a bowl. Season with salt and pepper. Dip each ball into the beaten egg and then coat well with the crumb. Repeat until all the balls are coated. Heat a very generous dollop of oil in a sauté pan over a medium / high heat. Cook in batches until well browned. Keep warm in the oven until all are cooked. Alternatively you can bake the coated balls in a very hot oven (200 degrees Celsius) for 15 minutes. Serve risotto balls hot with good-quality mayonnaise and lemon wedges on the side. Leftover balls can be stored in an airtight container in the fridge for up to three days. Will freeze well for up to two weeks. Reheat (thawed) in the oven at 180c (350f) for 15 minutes.